I love this time of year. I was nursing a holiday hangover yesterday and reading through my blog roll when I came across this post from the always fabulous Oonaballoona. And boy was I surprised to see my name and likeness. 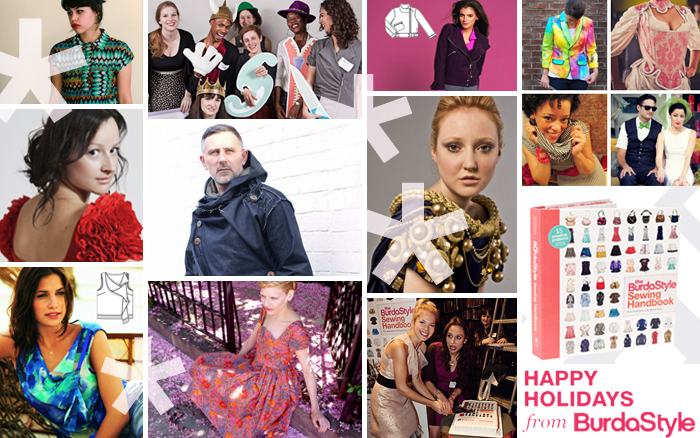 Burdastyle sent out a happy holiday wish and there I am among all sorts of super awesomeness! So much fun. I've been playing around a bit with this thinglink thingamajig. It looks like a very cool way to create collages and also embed links. Anyway, just a slightly self-indulgent post, eh? Ok, maybe totally excessive. Hope you all had a very merry holiday and wishing you a fantastic new year! I said I wasn't going to make anything this year for Christmas. I said I was going to give myself a break this year. But I couldn't resist making a few things. Although I didn't go crazy like I did last year. Just a few handmade gifts. I did a bit of shopping on etsy, too. So I'm still giving handmade things, just not made by my hands. 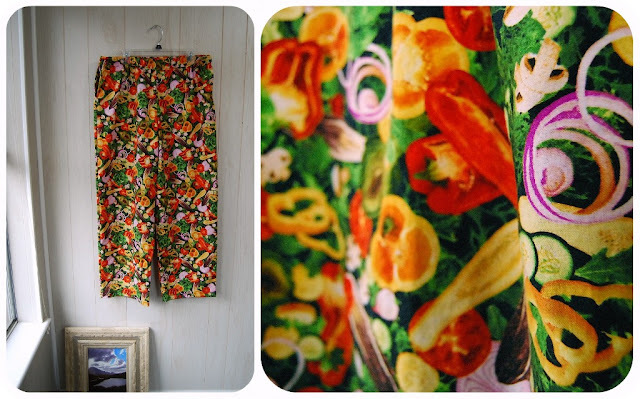 After my earlier trouser fiasco I thought you might like to see one pair of trousers I didn't screw up-- salad pants!! I mean, who doesn't want a pair of salad pants for Christmas? For my brother the chef, in case you are wondering. How awesome is that salad fabric. I'm pretty sure he won't read this before tomorrow. Hopefully. The cookies were made after I saw a picture on someone else's blog but I can't remember which. They're peanut butter. 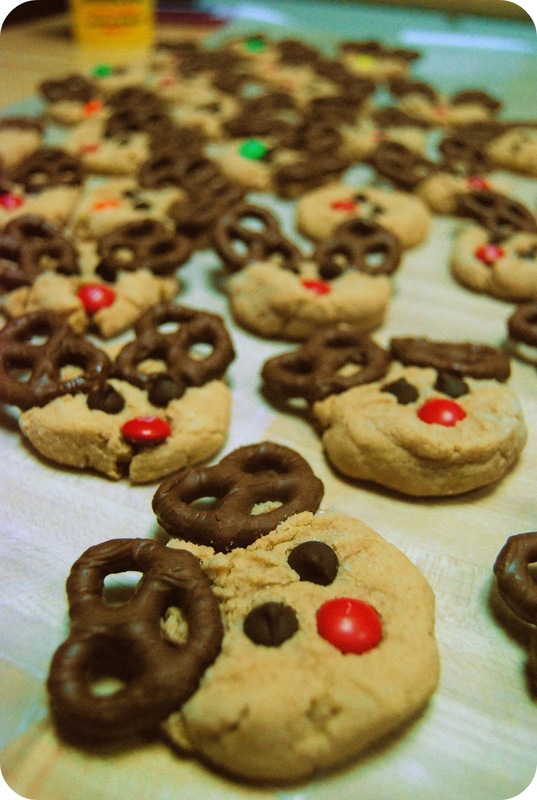 I ran out of red noses and antlers halfway through so there's some green-nosed antler-less reindeer, too. But delicious regardless. Wishing you all a very, merry Christmas! To be fair, though, these trousers were a ufo from almost two years ago. Early on in my sewing adventures I decided to have a go at making pants. 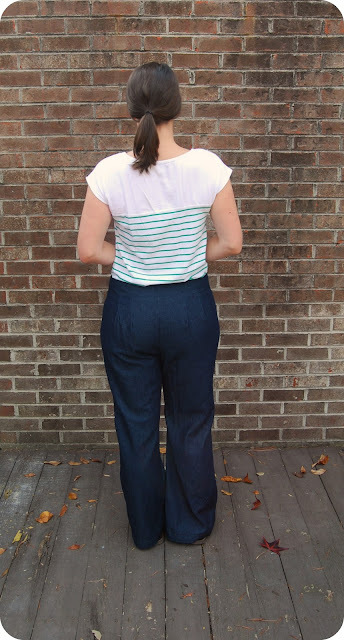 I used Simplicity 2700, a trouser pattern from the Amazing Fit collection. Being a total novice, I was completely undaunted by the idea of fitting trousers. I remember thinking I should cut a size larger- that way I wouldn't have any issues with being too snug in the hip and thigh. I figured I could then just spend some time taking them in at all the right places. Fit issues solved, right? Yikes! Posted only for the good of the group. Anyway, that's not how it worked out. 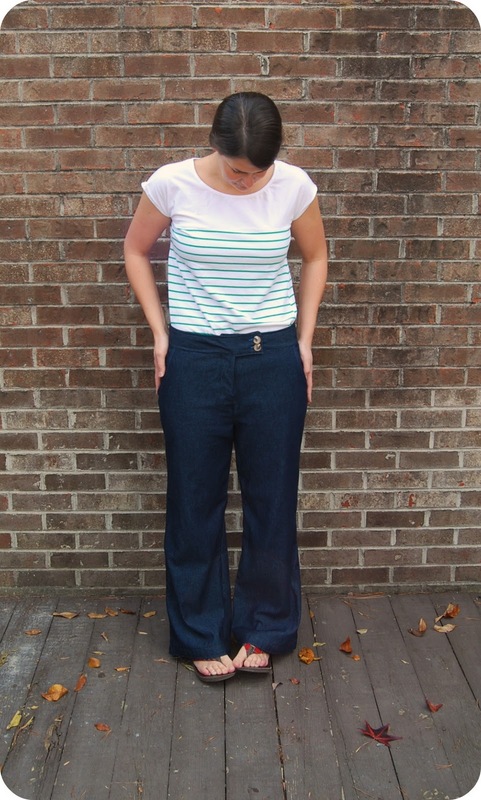 When I started these, however many months ago, I pretty much finished everything except the waistband. They were hanging in my closet unfinished because I mistakenly thought I still had to do the fly. I didn't realize that I had actually already sewn the fly, just not the waistband. My two-year-ago-sewing-self didn't do a half-bad job on the fly. Not necessarily good, but not horrible. They are made from very lightweight denim- no stretch. Let's compare to my favorite pair of jeans. I think it's interesting to see the two side by side. I know that the main reason the trousers on the right don't work is the size. I went up a size and I shouldn't have. Also, the fact that they are trousers is a factor. The fit is different than a normal pair of jeans. 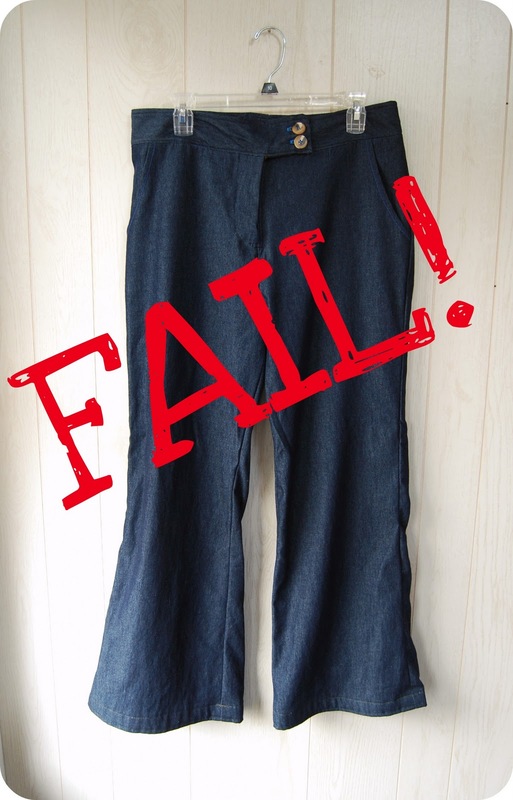 Trousers are less fitted through the upper thigh and hip. 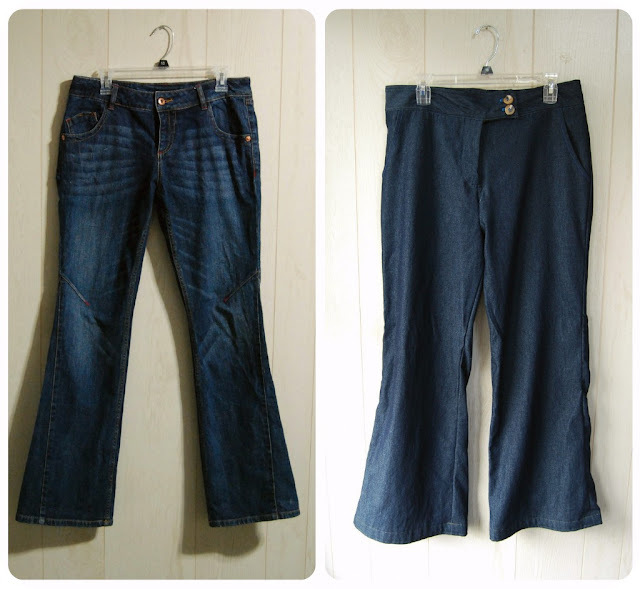 They hang from the bum while jeans conform a little more. I don't like my jeans to be super tight. Also, my favorite pair of jeans has an awesome knee dart and triangle shape insert below. I'd love to be able to come up with a pattern for that. Have you ever seen anything like that in a commercial trouser pattern before? Also, why is the fly reversed? There may be too many differences for true comparison, but here are a few observations on Simplicity 2700 anyhow; rise is too high (combined with the larger size means the crotch hangs too low), something is off with the crotch depth (don't ask me about crotch length, I have no clue) and the waistband is perfect for a Lego person. On the plus side, I feel like these would work well in a heavy, drape-y wool. Something with a bit of stretch. I like the double dart included in the "curvy" version. I think the darts help with the fit above the bum, though I'm not particularly happy with the rear view. Oh well. Moving on. Every sewing experience is just that, I guess- a little more experience. This is a totally random post. J and I had our two year wedding anniversary a couple of days ago and we celebrated by cooking at home, sipping champagne and decorating the tree. Last year we were bah-humbugs and didn't get a tree. The year before, we were on our honeymoon. I have decided that this shall be our new wedding anniversary tradition from now on. It was so much fun. It made us both feel all happy and homey. Could have been the champagne, too. Anyway, I played around with the camera and took these photos. I thought I'd share since I'm trying to be more adventurous with camera settings. I took several photography classes in high school and college but I remember nothing about all the manual settings. I'm guilty of having a really nice camera and shooting in automatic mode all the time. These photos are totally unedited and were taken in a dark room with only the tree lights on. I used the aperture priority mode, adjusting aperture and exposure compensation. They're a little blurry. And completely unoriginal. Anyone want to share what mode they like to shoot in? Or any favorite camera settings? Happy, homey wishes to you! Notice that there's already one missing? A package came in the mail the other day. J came in asking what in the world I ordered from Australia. I won a giveaway over on 3 Hours Past the Edge of the World for some awesome buttons and trimmings. I was joking when I told Steph to send me a Cherry Ripe-- well, okay I was halfway joking. Ok, I was secretly hoping. Ok, I shamelessly proposed the idea. Anyway, Steph you are totally awesome. She sent me not one, but three Cherry Ripes. One was promptly eaten. 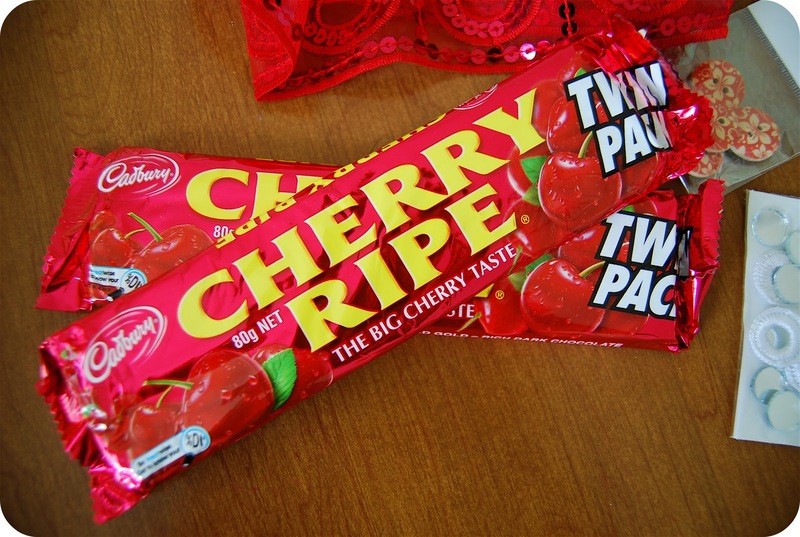 I spent a year of college in Australia years ago and I had quite a penchant for Cherry Ripes. (That and Toohey's New, but that's a whole other story...) We don't have anything like it here. It was so much fun to get a package from the far side of the world. 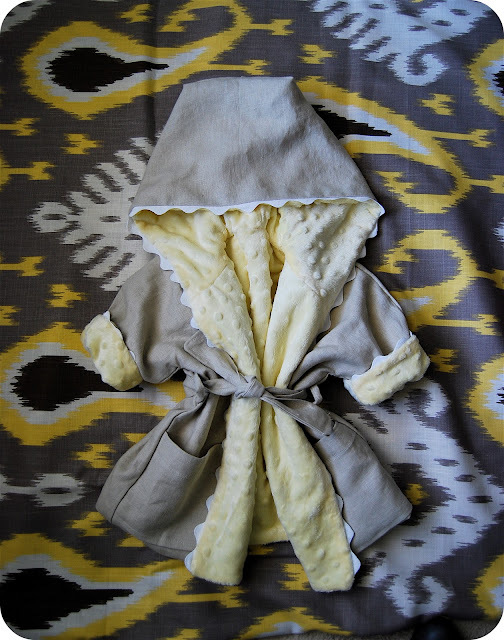 In sewing news, I made another baby robe. This one for a friend who I am also sewing nursery bedding and curtains for. I wanted it to match the nursery bedding- the fabric underneath the robe. I realized that the only fabric I had that matched perfectly was an expensive piece of linen I had been saving for something special. I decided that since Steph was so generous with her giveaway, I could be generous with my linen. Hopefully the baby likes luxury. And one more thing relating to awesomeness-- THANK YOU for all the incredible comments on my painted jacket post. I really was excited about the project but I had some fear that everyone would think it was really absurd. I cannot tell you how flattered I am by all the nice words. I don't say it often enough, but I really appreciate all the support and encouragement I receive from everyone through this little ol' sewing blog. Even if you just come and lurk, that's encouragement enough for me and I am grateful that you are here. The online sewing community is such a caring and inspiring place. I'm just in awe of it sometimes. Thank you, thank you, thank you.